Insure your wager on the highly-anticipated French derby with the PSG v Monaco Betting Offer, in case the ball finds itself behind the net in the first 15 minutes of the game. With the Premier League taking a break this weekend, all eyes will be on Ligue 1. Even if you don’t normally fancy French football, this is a great betting opportunity that will either see you get your Money Back up to $100 Free Bet, or you’ll end up winning a tidy sum, if you happen to back the right side for the encounter at Parc de Princes this Sunday. Whichever way you look at, you’re a winner with Intertops Sports’ PSG v Monaco Betting Offer, so place your bet on the match before Sunday (January 29) comes around to insure your bet. Please use the following Bonus Code to claim the PSG v Monaco Betting Offer: WEEKLYSB. After 21 rounds in Ligue 1, the Parisiens – the side that have clinched four straight domestic league titles over the same period – are still going through a transitional period, after letting go of Laurent Blanc in the summer and replacing him with former Sevilla boss Unai Emery. At the moment, they’re only in third position on the table (45 points), which is in stark contrast to their performances at this stage in the campaign in previous seasons. At home – Parc de Princes – Unie Emery’s men have clinched seven victories, while blundering on three occasions so far in 2016/17. Ensure that your wagers doesn’t go to waste with the PSG v Monaco Betting Offer. What’s quite worrisome is that fact that AS Monaco are finally shaping up to be serious Ligue 1 title contenders this season, after previous failed attempts at glory, despite being backed by the riches of Russian billionaire, Dmitry Rybolovlev. The club from the Principality managed to dethrone OGC Nice as the leaders of the table in recent games, which now sees them enjoy a slender two-point lead over their rivals. AS Monaco has so far accumulated 48 points, which resulted from 15 victories, 3 draws and only 3 losses. What’s even more impressive ds their away form, which stands at the second-best away record in the league, right behind their upcoming opponents PSG. Out of ten games on the road, six resulted in victories, while the other matches ended in two draws and two defeats. Although PSG are the favourite side for the match – playing in front of the home support – Monaco could quite well mount an offensive in the French capital on Sunday. So don’t forget to make use of the PSG v Monaco Betting Offer to insure your wager. PSG recently acquired German midfielder Julian Draxler from Bundesliga side Wolfsburg, after being becoming an increasingly marginalized player, following his public statement expressing his desire to leave the Volkswagen Arena. Along with Di Maria and 2016 summer recruit Jese from Real Madrid, PSG now boast a fearsome midfield line. Any of the players, including Draxler, can easily be converted to wingers, which could potentially be a decisive factor in the game. Don’t let this betting opportunity slip by you; make sure that you protect your wager on the thrilling encounter with the PSG v Monaco Betting Offer and collect $100 Free Bet as Money Back in case a goal is scored in the first 15 minutes of the match. 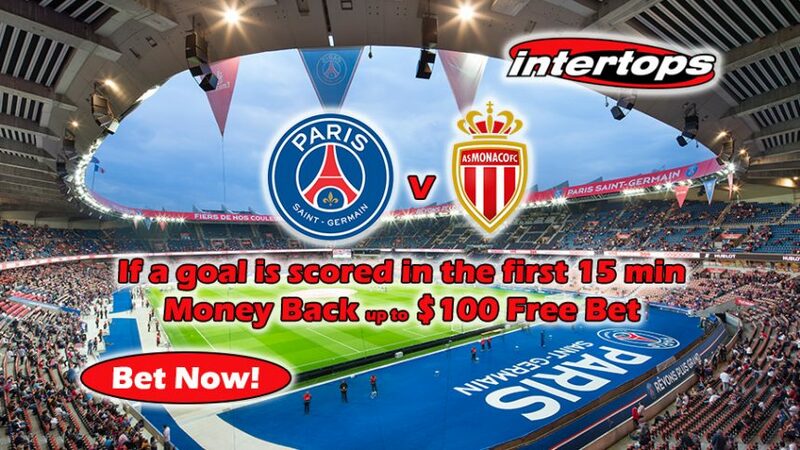 Grab $100 Free Bet with PSG v Monaco Betting Offer!